The vast majority of survivors of sexual assaults and harassment never report what happened to them. But now "there's an app for that." Actually several. 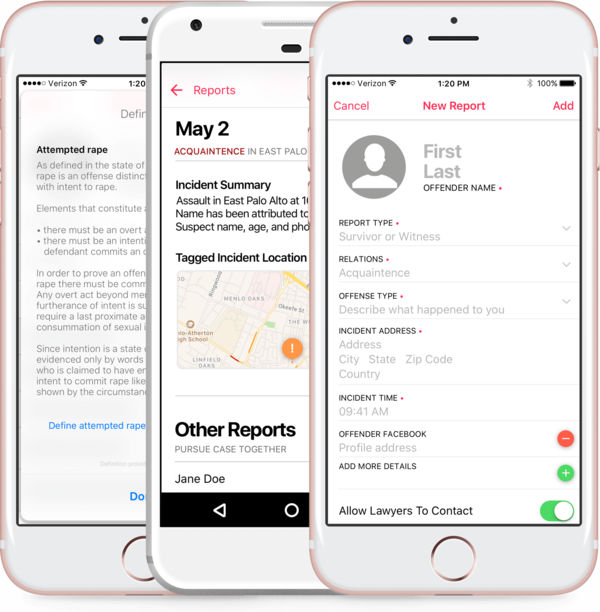 The JDoe app tags the location of incident as well as incident type, the relationship between the victim and offender, the offender's facebook address. One app called JDoe is just launching in cities across the nation. Another app, called Callisto, has been used on campuses for the past few years. This fall a new version will be offered for use by those who work in the tech industry. Those who've used the app so far, say it's far less traumatizing than reporting face-to-face. One student who says she was sexually harassed on campus by another student says she was too full of fear, and shame to take her complaint to campus administrators. Even as, she says, the harassment started to cause depression and anxiety, she couldn't bring herself to walk into the school's Title IX office to tell a stranger her story. Fighting back tears, she recalls being "afraid of being blamed," and afraid that she wouldn't be believed. She also worried it would have been too embarrassing to recount the explicit, vulgar language that was involved. It wasn't until months later, during spring break when she was back in the comfort of her own home, literally under her covers in bed, that she mustered up the resolve to submit a report through the app on her laptop instead. "It was almost like building courage behind a computer screen," she recalls. "Nobody is judging you at that moment. So you can get it off your chest without questioning if somebody is going to believe you. And you have that control in telling as much or as little as you want. I felt like I didn't have to have a filter. I could just say what needed to be said." Reporting apps encrypt a user's report, and can either send it directly to authorities, or keep a time-stamped record on hold until the student feels ready to submit it. Perhaps most significantly, a user also has the option to keep a report in a kind of 'escrow' unless and until someone else accuses the same person. That can be a game-changer, for survivors who fear 'going it alone,' and for those who may question whether what happened was just a misunderstanding or simply a one-time misstep. That's what happened to Ryan Soscia. Years after he says he was molested as a kid, Soscia says he reported just recently on the JDoe app — an app that he developed himself. "You know you can either pretend it didn't happen, or you can say I'm going to make sure you pay for this," he says. Soscia says the real inspiration for his app came several years ago, at a high school graduation party, when a friend revealed he'd been molested. Within hours, Soscia says, nearly ten other teenagers disclosed that the same person did the same thing to them. Only after realizing their strength in numbers, did any of those friends go to the police. "It was shocking," Soscia says, and it got him thinking about how technology could help ensure those kinds of discoveries are no longer left to serendipity. "We can find those connections exponentially faster," he says. "So the hope is we're going to prevent these types of crimes from happening. And the idea that that could have stopped this from happening to ten other people," he adds, "that's really powerful." Users can identify alleged offenders by multiple methods, including name, email address, or Facebook url. It's too soon for any reliable data, but Soscia says early indications are hopeful. The first hundred or so reports on JDoe turned up seven cases of multiple accusers, he says. Ultimately, the efficacy of the matching function increases as the pool of users does, but matches will not be made between reports submitted to different apps. Right now, the Callisto app can only be used by people whose colleges or companies buy in. Callisto would not disclose the cost for campuses, saying it ranges greatly, but according to some of those who've signed up, the cost can run from $10,000 to $30,000 a year. Since the non-profit launched in 2015, 13 schools have signed up. Callisto says the price for companies to offer the app to employees is not yet set. The JDoe model allows anyone to use the app for free. Instead, the for-profit gets its funding comes from a stable of attorneys who pay for access to potentially lucrative civil claims. Right now, the cost for lawyers who want to buy in is $1,000 per year, but the price will keep rising as more sign up. JDoe also takes a small cut of any settlement, but the attorneys all agree to take the cases on contingency, so clients pay nothing up front. "It's a win, win, win," says personal injury attorney James Hall, of Hall Law and Associates, who was among the first to sign up. Survivors, he says, end up with stronger cases; instead of "he said, she said," the cases become "he said, they said." Lawyers get better odds of winning, and bigger payouts. Hall adds that defendants get the reassurance that bogus claims will be screened out. "If it's a frivolous case, most lawyers are going to recognize that there will not be any money at the end of the day," he says. "It's not going to be profitable and it's going to waste time, and should not be brought." The app model for sexual assault or harassment reporting is especially useful for independent contractors and others who don't have Human Resources departments to turn to. But for those who have an HR option, lawyering up right off the bat might not be the best idea, says Peter Cappelli, Professor of Management at The Wharton School and Director of Wharton's Center for Human Resources. Instead of "helping conversations and solving problems" he says, that might just "create bigger conflicts." Cappelli also takes issue with the core concept of survivors deciding whether or not to report, based on what others have done. "I don't think we want to have a standard where the decisions are crowdsourced," he says. "I think what you want is to tell people [that] the criteria [for whether or not to report] are policy related, not personally related, and you should bring forward anything that fits the criteria, not [based on] whether you feel enough other people have made the complaint or not. We want to sometimes encourage people to do things they might feel uncomfortable about." Cynthia Garrett, co-president of Families Advocating for Campus Equality, a group that represents accused students, agrees. While no one wants the reporting process to be re-traumatizing for survivors, she says, there is also such a thing as making it too easy. "People make accusations for all kinds of reasons," she says. "What I see as a problem is if you have an angry ex-girlfriend [who files a report for revenge,] and then it's out there. It's a permanent registry of unsubstantiated #MeToo style accusations, that will be discoverable for decades." Garrett says it's unfair that people might not even know they've been named, and would have no chance to "set the record straight." For example, if someone makes a complaint against a college student using the matching function, and then a new complaint is logged 15 years later, that would make a match. But Garrett says employers might not really understand what the old allegation entailed, or whether it was ever investigated. "An employer will interpret that [old report] as more than it may have been" says Garrett. "But the problem is that decades later [the accused person has] no way to defend themselves. And I find that very problematic." Developers dismiss those concerns, saying reporting apps are just a kind of hotline for allegations that will ultimately be vetted by humans. "We're not the decision makers," says JDoe developer Soscia. "We're just the ones who find the underlying dots that should have been connected, but most likely wouldn't have been without this technology." As the student who reported her harassment through Callisto puts it, the apps are neither judge nor jury. "It's not a verdict," she says. That is where the Title IX office, or HR, or the courts come in. "They can do full blown investigation and if it's false, it's false. And if it's true, then they can take further action." In her case, school officials issued a mutual no contact order, and the harassment stopped. If her only reporting option was walking into a stranger's office in some campus administration building, this student says, she probably would still be suffering in silence. By most accounts, the majority of people who experience sexual harassment or assault never report what happened to them. High tech may have a solution - apps that can help survivors come forward. NPR's Tovia Smith reports. TOVIA SMITH, BYLINE: It's easy to understand the many reasons why alleged victims don't want to report. There's the worry they won't be believed, fear of reprisals and embarrassment. UNIDENTIFIED PERSON: That was really hard for me to think about - telling another person, especially someone you've never really had contact with before. SMITH: This woman, who asked that her name not be used to protect her privacy, says she was sexually harassed at college by another student. And even though it was making her depressed and anxious, she couldn't bring herself to tell authorities at school. UNIDENTIFIED PERSON: Because I was afraid of being blamed for it. SMITH: It wasn't until spring break when she was back in the comfort of her own home, literally under her covers, that she mustered up the resolve to finally get it out not face to face but through an app on her laptop. UNIDENTIFIED PERSON: It was almost like building courage behind a computer screen because nobody is judging you at that moment. So you can get it off your chest without questioning if somebody's going to believe you. 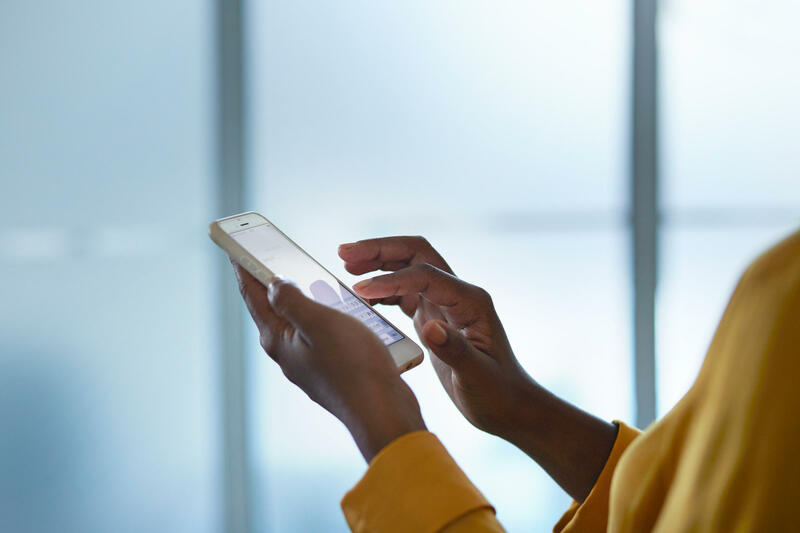 SMITH: The app she used called Callisto lets users send an encrypted report directly to school officials or to keep it on hold until they're ready. Users can also choose to hold a report unless and until someone else accuses the same person. That's big for survivors who fear going it alone and for those who may question whether what happened was just a misunderstanding or a one-time misstep, as Ryan Soscia once did. Years after he says he was molested as a kid, Soscia says he reported it just recently on a brand-new app he developed himself called JDoe. RYAN SOSCIA: You can either pretend it didn't happen, or you could say, I'm going to make sure you pay for this. SMITH: Soscia says the real inspiration for his app came a few years ago at a high school graduation party when a friend revealed he'd been molested. Within hours, Soscia says nearly 10 others disclosed the same person did the same thing to them. And only after realizing their strength in numbers did his friends go to the police. That got Soscia thinking about how technology could help ensure those kinds of discoveries are no longer left to serendipity. SOSCIA: We can find those connections exponentially faster. So the hope is we're going to be able to prevent these types of crimes from happening. And the idea that that could have stopped this from happening to 10 other people - that's really powerful. SMITH: While the Callisto app can only be used by people whose colleges or companies buy in for what could be $10,000 to $30,000 a year, the JDoe model allows anyone to use the app for free. Funding comes instead from a stable of attorneys who pay anywhere from $1,000 to $20,000 a year for access to potentially lucrative civil cases. The lawyers all agree to take the cases on contingency. JDoe also gets a kicker if they win. But clients pay nothing upfront. JAMES HALL: It's a win-win-win. SMITH: Attorney James Hall was among the first to sign up. He says survivors end up with stronger cases. Instead of he said, she said, they're he said, they said. Lawyers get better odds of winning and bigger payouts. And defendants, Hall says, get reassurance that bogus claims will be screened out. HALL: If it's a frivolous case, most lawyers are going to recognize that there will not be any money at the end of the day, that it's not going to be profitable. It's going to waste your time and should not be brought. SMITH: But others worry that getting everyone to lawyer up from the get-go might hurt more than it helps. Peter Cappelli, a professor of management at The Wharton School, also questions the basic concept of survivors deciding whether to report based on what others have done. PETER CAPPELLI: I think what you want is to tell people the criteria are policy related. They're not personally related. And you should bring forward anything that fits the criteria and not, you know, whether you feel enough other people have made the complaint or not. SMITH: Cappelli and others also raise concerns about due process. CYNTHIA GARRETT: You know, it's a permanent registry of unsubstantiated #MeToo-style accusations. And the reports will remain even if a student was found not responsible. SMITH: Cynthia Garrett is with a group that represents accused students called Families Advocating for Campus Equality. She worries that complaints can be filed without the accused even knowing. Then it would take only one new claim to match with the old unfounded or untried ones, she says, to ruin a career. GARRETT: And when somebody down the road makes this complaint for, oh, God, he made a sexual joke that was inappropriate and the app shows up, oh, there's been previous reports, an employer will interpret that as more than it may have been. But the problem is that decades later, they have no way to defend themselves. SMITH: Developers dismiss those concerns, saying reporting apps are just a kind of tip line for allegations that will ultimately be vetted by humans. As the student who reported her harassment by app says, the apps are neither judge nor jury. UNIDENTIFIED PERSON: It's not a verdict. That's where a campus comes in. They can do a full-blown investigation. And if the investigation comes out as false, then it comes out as false. And if it comes out as true, then we take further action. SMITH: In her case, school officials issued a mutual no-contact order, and the harassment stopped. If her only reporting option was walking into a stranger's office in some campus administration building, this student says, she probably would still be suffering in silence. Tovia Smith, NPR News. (SOUNDBITE OF RACHEL BOYD'S "BACK IN YOUR BOX") Transcript provided by NPR, Copyright NPR.